World’s first realistic guitar doubler pedal with up to 3 additional guitar tracks, tightness control and stereo I/O for massive sounding guitar riffs. 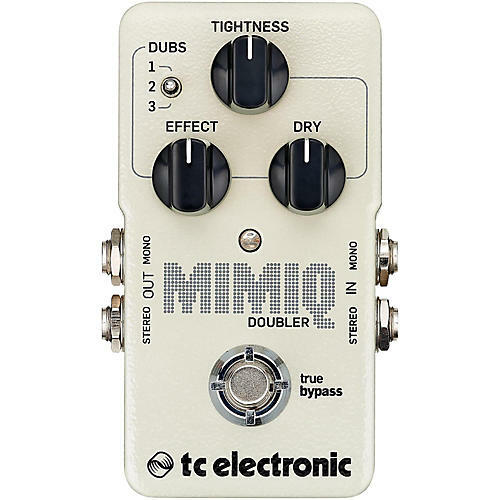 Mimiq Doubler is the first pedal in the world to perfectly distill the magic of real studio-grade doubling. Its highly advanced doubler algorithm captures all of the random subtle nuances in time, attack and pitch that would occur in the studio and makes it available in a super-intuitive stompbox ready for the stage. Mimiq Doubler gives players the option of adding up to three additional guitar tracks. And with fine-tuned control over the tightness of the doubling and the blend between dry and effected signals, musicians will be able to conjure everything from subtle riff-fattening effects to ultra-realistic and tight multi-tracked guitar lines. Now add Stereo I/O to the mix for larger-than-life live tones and it’s clear to see that Mimiq Doubler truly is the new king of clones.